Because later you will be forced to make the decision at a time not of your choosing. Whom Is The More Dangerous? I just finished this book and it was an excellent read. Much of what was presented, I already knew as an LEO. However, it was a great refresher on those points, and also brought new info to light. Tim Larkin also presents fresh insights and ways of thinking outside the box in which we are conditioned to think. 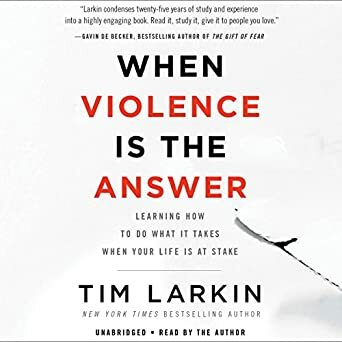 Author Larkin echoes the teaching of Krav Maga in that avoidance is best, and not to fight or be provoked is a victory. Marine General James Mattis said it very well in his statement that one should be professional, be polite, but have a plan to kill everyone you meet. You might also want to check some of his other books, such as: “Survive the Unthinkable.” Both are great additions to your library and your knowledge base. United Socialist America…You Ready For It? The 4 Ways They Are Chaining Up Our Liberty While Laughing In The Face Of Our Freedom! It is not often I veer away from technology as a point of discussion on my broadcast. There are two topics however that are always assured to gain my ire and attention…Socialism and Globalism! These are the Anti-America sentiments of our modern day world. Sentiments that use to remain overseas but now permeate the very walls of Capitol Hill. These Socialist / Globalist Cabal demons laugh in the very face of our Liberty and spew concepts of repressive failed Governments of the World. They target our majority classes and sell them the snake oil salesmen promises of a better future and equal pay, rights, and liberties. In actuality, they are selling them the end of America. The scary part of this story, however, is that we are letting them, electing them into Congress and Senate and now they are even running for President. I remember an exercise from the academy where we learned to clear a school. We learned about light discipline, fields of fire, and looking up. One ‘bad guy’ hid on top of a refrigeration unit and we almost walked right past him. Many stories are told of WWII and Viet Nam where soldiers failed to look up into the trees and snipers shot them or their buddies. Now I know some folks say ‘don’t look up’ so the surveillance cameras don’t get you, but that means situational awareness goes right out the window. I’d rather be on camera than be blindsided by a threat. Put the phone down and nobody will get hurt.